One of the benefits of homeschooling is the ability to implement a variety of resources to encourage learning. While we are conservative on screen time in our home, especially with our younger ones, we know that visual media can be valuable. Understanding the learning possibilities through media, SmartKidz Media has created SmartKidz Media Library for Homeschoolers. We were able to review this media library over the past several weeks and I’d love to share a bit about it with you. SmartKidz Media Library for Homeschoolers provides a wide range of educational videos and other resources. The topics include: animal kingdom, history, culture, science, music, sports and more. Along with the videos, SmartKidz has downloadable study guides, flash animated e-books, and educational games. Smartkidz Media content is “streaming” so there is no need to download anything to your computer or device. Since this is a subscription based program, there are no ads or pop-ups to deal with. SmartKidz Media Library has two options for subscriptions: monthly or yearly. A 14 Day Free Trail is available to see if the content would be appropriate and beneficial to your home. It does require credit card information. How Did We Use SmartKidz Media Library in our Homeschool? We used SmartKidz Media Library very informally in our homeschool. Instead of using it to supplement specific topics we were studying, we just watched different videos that my children showed interest in. There is no doubt that the Wonderful World series about various animals was a favorite. My thoughts, initially, were that this would be great for my younger ones. It never failed that when the videos started, everyone gathered around to watch. Who can resist polar bears, beavers, elephants, and monkeys? It was interesting to see, even when using it informally as we did, how often we learned about animals we had come across in our school readings. Seeing the connections being made is a wonderful thing! Another set of the videos we enjoyed as a family were the How Did They Make That? series. In an afternoon we learned how marbles, candles, and money are made. In one episode, while learning about birthday cakes, we discovered where cream of tartar comes from. I will confess that I had no idea! There are other selections that I am interested in viewing but I am slowly previewing content. While this media library is designed for families, everyone has personal standards for what their children are allowed to view. What is acceptable for my older ones may not be beneficial to my younger ones. New content is added regularly to SmartKidz Media. Recently some history resources for World War II and The Cold War have been added. I know my older children will likely enjoy these when we reach those studies in our history. We are a documentary loving family! SmartKidz Media Library for Homeschoolers has been a fun and educational addition to our resources. Using it informally on rainy afternoons or when we need a bit of downtime has worked really well. Children are always learning! I am working on a plan for using the World Wide Discovery Travel videos with a bit more structure. Perhaps we will take a few imaginary field trips around the world. Want to learn more about what SmartKidz Media Library has to offer? Check out reviews by other Crew Members! 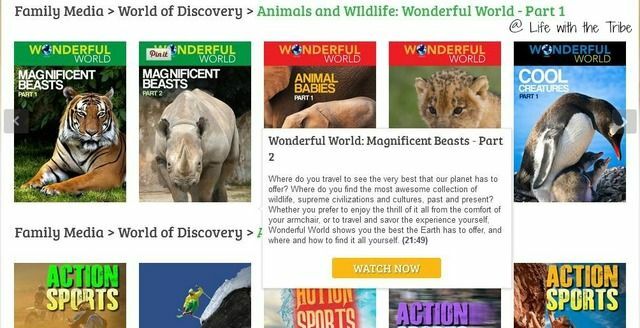 This entry was posted in Homeschool, The Tribe, TOS Crew Reviews and tagged computer, Homeschool, music, review, science by sweetie. Bookmark the permalink.